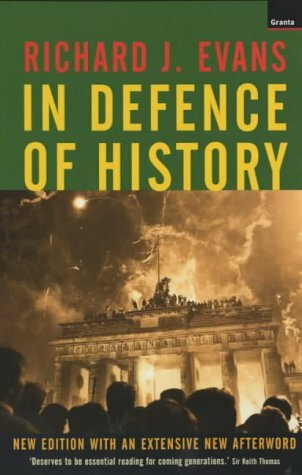 For reasons too lengthy to go into, I just read In Defence of History by Richard Evans (first published 1997). 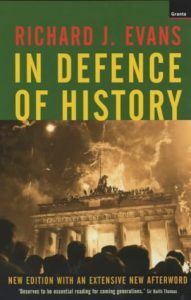 It’s a spirited counter-attack on the post-modernist/structuralist attack on history, particularly its most extreme versions. Consider for example Barthes’ claim that history is, “A parade of signifiers masquerading as a collection of facts.” Evans argues that postmodernist historians make the false claim that ‘traditional’ historians naively take historical documents at face value, whereas they are well aware that the degree of transparency of historical texts varies: to pit naive belief in the documents against knowing relativism about texts is to create a false duality. This entry was posted in Main Page and tagged history by Diane Coyle. Bookmark the permalink. Wonder if you read this ?